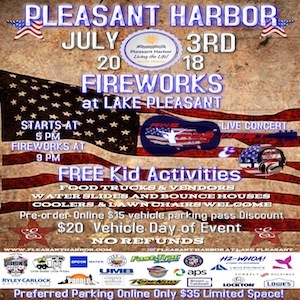 Join us for our annual July 3rd Fireworks Celebration right here along the shores of Lake Pleasant. Festivities start at 5pm. FREE Kid activities with UNLIMITED inflatable waterslides and bounce houses available! Live Concert by the ROB WEST BAND! Food trucks, novelty vendors, and more! So come enjoy the fun! Even get there early enough to go down the tallest waterslides in the world right here at Pleasant Harbor Marina! Lawn chairs and coolers welcome! See you all then! Festivities begin: 5:00 p.m. | Fireworks begin: 9:00 p.m.